Achema 2018, Hall 11, Booth C3 - Siemens AG and Process Systems Enterprise (PSE), the Advanced Process Modelling (APM) company, today announced at Achema that they have signed a long-term collaboration agreement to bring the power of PSE’s gPROMS APM technology to Siemens automation and digitalization offerings for the process industries. Under the agreement, the companies are bringing to market a new set of solutions for long-term equipment and health monitoring, soft-sensing, prediction of future process performance, real-time optimisation, and operator training incorporating high-fidelity models. The solutions are all based on the combination of process models that embody deep process knowledge with real-time as well as historical plant data. Typical customer benefits of such applications include better operations through enhanced, up-to-the-minute decision support information; improved maintenance scheduling through run length prediction; improved economics from real-time optimisation; and improved asset integrity from better health monitoring. 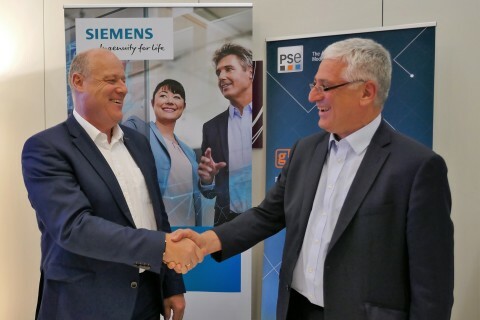 At Achema, Siemens and PSE are demonstrating digital process twin technology for an ethylene plant, implemented using PSE’s gPROMS Olefins Operational Excellence tools. Industrial application of such techniques on a large-scale ethylene plant has demonstrated a two percent improvement in yield. Also demonstrated are a soft sensing application and model predictive control for a continuous wet granulation tablet manufacturing in pharma. Eckard Eberle, CEO of the Process Automation Business Unit (PD PA) and Director in charge of the Siemens booth at the Achema, says: “Siemens has already made Integrated Engineering a reality; by collaborating with PSE, we are taking a further step into model-based operations with two very complementary sets of technologies. This is digitalization at its best.” Costas Pantelides, MD of PSE, says: “The combination of high-fidelity predictive models and real-time data is enormously powerful. This is a time of extraordinary opportunities for the process industries, made possible by the culmination of many years of development in advanced modelling and in the enabling computer science and mathematics”.